Add us to your contacts to ensure this email arrives in your inbox. We are seeking the views of residents about how hazardous waste collection services should be provided. Stay up to date with road works and traffic regulation orders where you live. Check out the council's weather cameras around the county. Our community directory allows you to search online for a range of community information, including childcare, support, activities, clubs, organisations and groups. See the latest county council planning applications. Search here for the latest job vacancies with the county council. Tell us what you like or don't like about North Yorkshire Now and what you would like to see in the newsletter. Send comments to editor@northyorks.gov.uk. If North Yorkshire Now drops into your email spam folder, please add it to your list of safe emails so you won't miss future issues. Access council services online at www.northyorks.gov.uk. You can also follow the council on Twitter and Facebook. The County Council is one of only seven local authorities selected to trial a new service to help looked-after children and young people. 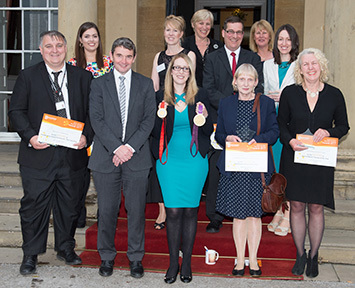 We have celebrated our first teaching awards in partnership with secondary school headteachers. A project which aims to reduce the stigma associated with mental health has been commissioned. Children’s Minister Robert Goodwill has visited a County Council centre that leads the way in improving young people’s lives. A joint commitment to build on the success of health and safety advisory services has been made by us with City of York Council. People are being given a further chance to comment on proposed changes to the Minerals and Waste Joint Plan publication draft. Children and young people with special needs from Harrogate and the Yorkshire Dales will be out and about this summer. We're backing a campaign to help children to get their recommended amount of daily activity during the holidays and beyond. There's still time for children aged four to 11 to join the library Summer Reading Challenge to read six books during the holidays.